One of my favorite ingredients to play with is salmon. I absolutely love it, but I only get to cook it for myself. Joe doesn’t like any seafood and Riley hasn’t taken an interest. Luckily, salmon fillets come in single serving sizes. 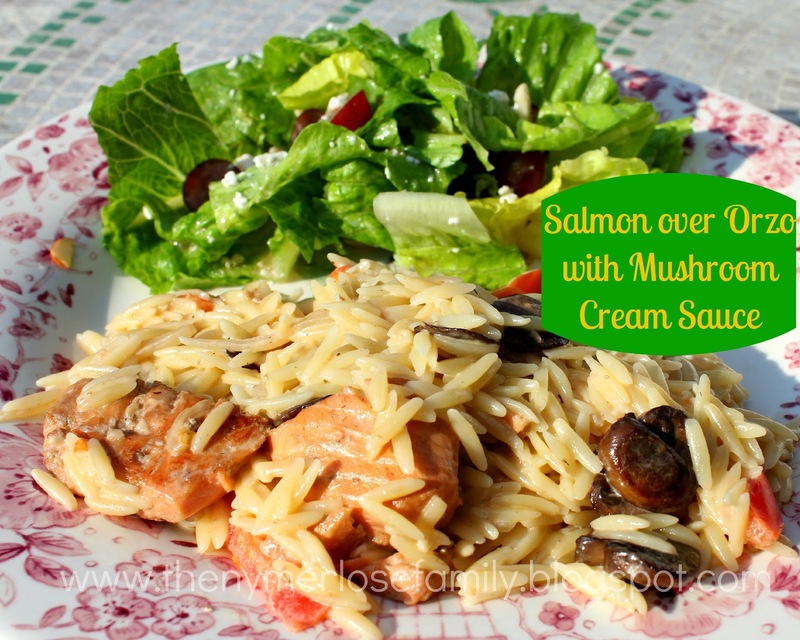 My Salmon over Orzo with Mushroom Cream Sauce is great with a grape salad on the side and is light for the hot weather we’ve been having. Cook pasta according to package. Saute the garlic and mushrooms in olive oil. Add the onion, tomatoes and salmon chunks and cook for 3 – 4 minutes. Add the cream and simmer until it begins to thicken. Add the cooked pasta to the pan and season with salt and pepper. I loved that this meal was quick and a one pan meal. All the ingredients were light and healthy. 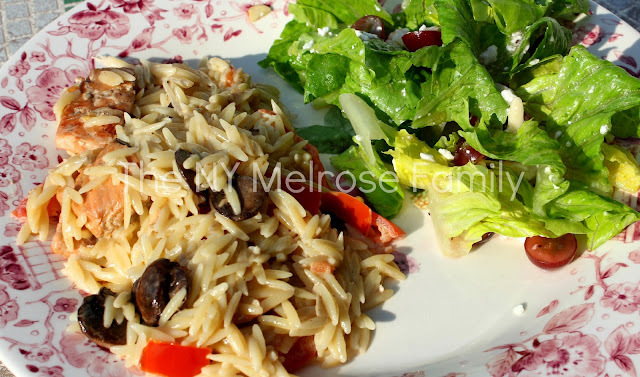 The orzo paired with the grape salad was perfect. The grape salad was simply romaine lettuce, red seedless grapes, feta cheese and a light raspberry vinaigrette. This looks delicious! I love love love salmon and am always looking for good salmon recipes! The mushroom sauce is a nice twist. Thank you for sharing Jenny and have a great weekend! This sounds really good. I never cook with Orzo… I think I need to give it a try. What the WHAT?! Where has this been all summer? Thanks for the recipe, goodness I needed it! I linked in a pizza made with roast chicken leftovers to Live.Laugh. Rowe's linky party. Have a great week. I just want to say I’m new to blogging and site-building and certainly enjoyed this blog. Probably I’m want to bookmark your website . You surely come with fabulous posts. Many thanks for sharing with us your web page. I found this recipe and thought I would give it a shot for an early Valentine’s Day dinner. My 7 year old was telling me all the reasons why he would not be eating dinner, due to the lack of interest in various ingredients. Yet, when dinner was served, he had the cleanest plate of all! Easy and most importantly, DELICIOUS!